"The first gentleness she has ever known." 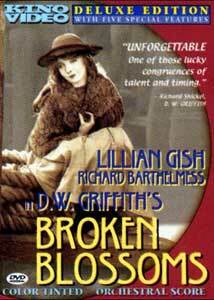 Other Stars: Donald Crisp, Edward Peil Sr.
D.W. Griffith's Broken Blossoms stars Lillian Gish as Lucy, a fifteen-year-old Cockney girl who lives in mortal fear of her adoptive father, the struggling boxer known as Battling Burrows (Donald Crisp). When she stumbles into the shop of Cheng Huan (Richard Barthelmess) after a brutal beating over a kitchen mishap, the Chinese shopkeeper's gentle affection promises a better life for both of them. Meanwhile, the angry, virulently racist Burrows searches for his "stolen" daughter. This intimately-scaled dramatic feature was something of a departure for D.W. Griffith, director of such silent-screen epics as Birth of a Nation and Intolerance, and it plays a bit like an extended version of the director's shorts made at the Biograph studios. Griffith invented much of the language of film as we know it, and his skill is in full flower here—compositions are attractive, editing is seamless and the story flows naturally, using narrative text inserts and relying only occasionally on the clumsy convention of dialogue cards. Lillian Gish's luminous beauty and subtle acting (by silent film standards) enhances this melodramatic tale; a medium shot of young Lucy sitting alone near the London docks is charged with unvoiced longings and quiet suffering. Donald Crisp is appropriately bombastic as the larger-than-life Battling Burrows, and one can almost hear his unreasoning roars of anger and discontent. Richard Barthelmess fares less well as Cheng Huan, due to his makeup more than his performance—his Caucasian cleft chin and heavy-lidded "Chinese" eyes give him a sleepy, dim-witted appearance that's totally at odds with his character's gentle, wise approach to the world, muting his joys and sorrows to some degree. Barthelmess' appearance is not the only racially-insensitive element here—Broken Blossoms was produced in 1919, and the conventions of the time are certainly in evidence. Another Asian character named Evil Eye is portrayed by the decidedly Occidental Edward Peil Sr., and a white actor in blackface can be glimpsed briefly in an opium den scene. While it's not at all surprising to 'hear' Burrows refer to Cheng Huan as a "dirty Chink," it's more disconcerting to see the same term used in the neutral, black-and-white narrative text inserts, along with the slightly less pejorative "Yellow Man." The story proper is open-minded and progressive, but modern eyes will widen a bit at the casual racism of eight decades ago. Broken Blossoms takes effortless advantage of its nascent medium, filling the space of a few days in a handful of locations with even pacing, richly drawn characters and engrossing action. If you've never experienced the joys of the silent cinema, I can think of no better introduction than Broken Blossoms, a classic in every sense of the word. Image Transfer Review: Broken Blossoms is presented in its original 1.33:1 aspect ratio, full-frame, though Griffith frequently modifies the framing to produce windowboxed and letterboxed vignettes. The source print is in poor condition, as expected, with constant emulsion flecking, running scratches, splices and other damage, but the film is more than eight decades old, from an era when film "preservation" wasn't anyone's priority, and the condition can be forgiven. Where the disc shines is in its sharp, color-tinted image—years of worn 16mm prints and Blackhawk VHS videocassettes had led me to seriously underestimate the level of detail in Broken Blossoms, and Kino's DVD is a revelation. It's mastered from a high-quality 30-fps video source, unavoidable in this case, as the DVD format doesn't directly support silent cinema's lower frame rate—the lack of frame-by-frame digitization is a small price to pay for proper projection speed. Stable and amazingly detailed, I can't imagine Broken Blossoms looking any better than this. Audio Transfer Review: Kino presents Broken Blossoms with a brand new Dolby Digital 2.0 score composed and performed by Joseph Turrin. The soundtrack consists almost entirely of music, with just a few non-intrusive sound effect cues. The orchestration occasionally betrays its synthesizer origins, but Turrin's score is well thought out and executed, with solid themes arranged and intertwined to support the film's action effectively and nearly transparently. Turrin's approach evokes the period without the self-consciously "old-timey" character of some silent film scores I've heard, and the digitally recorded score sounds just great, with comprehensive frequency range and clarity. This filmed introduction by Ms. Gish is taken from Paul Killiam's The Silent Years TV series, produced in the early 1970s. The younger Gish sister is charming and entertaining as she recalls memories and trivia from the production, though the unsophisticated one-take nature of the presentation includes a few verbal stumbles and hesitations. Following the introduction (and a fade-out where the main attraction played originally), Ms. Gish discusses Romola, a 1924 project in which she starred with her sister Dorothy, another Biograph veteran. This series of 27 screens presents the unabridged text of Burke's unfortunately titled short story, on which the Broken Blossoms screenplay was based. The on-screen pages are numbered for convenience, and the font is large and easily readable on a television screen, though there are a few typos. A few screens of text notes about the score, written by its composer Joseph Turrin, followed by a photograph and biographical notes on the prolific Mr. Turrin. This segment presents a new recording of the Broken Blossoms theme song, written by Robert Edgar Long and Louis F. Gottschalk and marketed by the home sheet-music industry at the time of the film's release. Joseph Turrin provides a crisp keyboard rendition of the song, while the sheet music is displayed section by section. Unfortunately, while the lyrics are visible onscreen, no vocals are provided; one finds oneself wishing for a sing-along bouncing ball. A few screens of comments by the great director on his theories concerning leading lady "types" suitable for the screen, drawn from Photoplay magazine articles originally published in 1918 and 1923. His comments on the necessary eyes, face and "inward illumination" are interesting, if a bit narrow in scope. Broken Blossoms is one of the finest silent films ever made, rich, subtle and almost completely dialogue-free. Kino's DVD edition looks fine and features several worthwhile historical supplements. Highly recommended.